Intermittent hypoxia, Obstructive sleep apnea hypopnea syndrome, Cortical neuron, Apoptosis. Obstructive Sleep Apnea Hypopnea Syndrome (OSAHS) is a chronic disease characterized by repeated upper-airway complete (apnea) or partial (hypopnea) obstruction during sleep-caused hypoxemia and repeated nocturnal awakening. This syndrome often causes multi-organ and multi-system damages, including cognitive impairments [1,2]. Particular attention has been directed at the cognitive impairment and behavioral disorders in children with OSAHS [2,3]. The typical pathophysiological features of OSAHS are Intermittent Hypoxia (IH) and sleep fragmentation, which have been both reported to cause damage independently in brain regions associated with cognitive functions . Nevertheless, it was also considered that the cognitive impairment in patients with OSAHS can be caused by synergism between IH and sleep fragmentation , despite the complex relationship of one multi-factor . Currently, the majority of studies addressing the cognitive impairment associated with OSAHS have used IH as the exposure factor . The brain is extremely sensitive to hypoxia, suggesting that the impact of IH on brain tissues might be the underlying mechanism for the cognitive impairment in OSAHS. In one study, the brain environment in OSAHS was simulated in rats and confirmed that IH can induce neuronal apoptosis much easier than slow hypoxia, in particular in the hippocampus and cortex [7,8]. Based on this, several attempts have been made to simulate the pathological process of OSAHS using different IH modes [9,10]. In this in vitro study, we cultured primary embryonic rat cortical neurons, and induced different IH modes of OSAHS, aiming to observe the changes in neuronal activity and apoptosis following exposure to IH and to explore the possible causes of OSAHS-associated cognitive impairments. Embryonic d 17 (E17) Wistar rats were provided by the Experimental Animal Center of School of Medicine, Shandong University. Neurobasal medium, nerve growth factor B-27, and 0.25% trypsin were purchased from Gibco Co. Dulbecco's Modified Eagle Medium (DMEM) high glucose culture medium was purchased from Whittaker Bioproducts. In addition, 1% penicillin-streptomycin, poly-L-lysin (PLL), cytarabine, and fluorescein isothiocyanate (FITC)-labeled fluorescent secondary antibodies were purchased from Sigma. Goat serum and 10% Fetal Bovine Serum (FBS) were purchased from Hyclone. 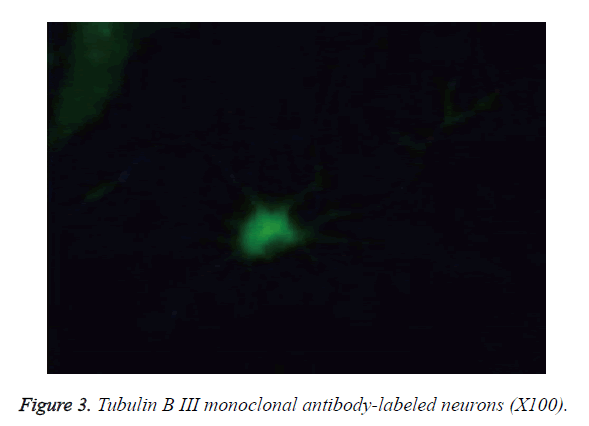 Finally, the anti-tubulin B III monoclonal antibody was purchased from Abcam Co.
Neuronal primary cultures were prepared based on the method described elsewhere [11,12], with some modifications. Under sterile conditions, the cerebral cortex was isolated from E17 rats, and then placed in 4°C Hank’s Balanced Salt Solution. After removing the leptomeninges and vessels and washing, the cortex was cut into pieces and digested for 20 min using 0.125% trypsin at room temperature, shaking intermediately twice. DMEM containing 10% FBS was subsequently added to terminate the digestion, and one pipette was repeatedly used to pipet the clumps gently into the cell suspension. After centrifugation at 1,000 revolutions per min for 5 min, the supernatant was discarded to harvest the cells. Subsequently, cells were re-suspended using neurobasal medium containing 2% B-27 and 1% penicillin-streptomycin and the cell density was adjusted to 1 × 105/ml. The cells were then seeded in PLL-coated 6-well plates (2 ml/well) and cultured at 5% CO2 and 37°C. Twenty-four hours later, the medium was replaced with neurobasal+B-27 serum-free culture medium and changed once every 3 d [13,14]. On the third day of in vitro culture, cytarabine (final concentration 10 μmol/l) was added to inhibit the proliferation of the glial cells (removed 24 h later). The cell growth was regularly observed using an optical microscope, and immunofluorescence was performed on culture d 6 . The primary neurons cultured for 6 d were fixed in 4% paraformaldehyde at room temperature for 30 min, incubated with 3% H2O2 to block endogenous peroxidase, followed by incubation with 5% goat serum for 1 h. The tubulin B III rabbit anti-mouse monoclonal primary antibody for neuronal labeling (1:200) was then added for overnight incubation at 4°C. Subsequently, after washing in phosphate-buffered saline on the next day, the FITC fluorescence-labeled secondary antibody (1:400) was added for 1 h incubation in darkness at room temperature, followed by mounting and microscopic examination. The IH equipment was self-made and described elsewhere . Briefly, it consisted of a low oxygen chamber, gas transmission pipelines, programmable devices, and gas supplies. The airtight plexiglass box was self-made and contained holes for air exchange, and a one-way gas outlet valve. Nitrogen was connected to both ends (Jinan oxygen-producing plant) and medical compressed air (Atman-6500 air pump) was connected via the gas transmission pipelines. Another hole was connected to the S-450 Oxygen Detection alarm (IST-AM Co., USA). The IH chamber was filled with nitrogen and compressed air in turn with the oxygen detector to monitor the oxygen concentration. There was a 30 s elution time between the IH (1.5% O2) and normal oxygen conditions (normoxia, 21% O2), and both conditions were attained by adjusting the gas flow. The primary cells cultured for 7 d were placed into the IH chamber, and were assigned to either Intermittent Hypoxia (IH), Persistent Hypoxia (PH), Intermittent Normal Oxygen (INO), or control (CON) groups. (1) In the IH group, hypoxia (1.5% O2) was induced either for 15 s with normoxia (21% O2) for 1 min 45 s (IH subgroup (sub-IH) A; IH frequency [times per h], 20.00), 3 min 45 s (sub-IH B; IH frequency, 12.00), 5 min 45 s (sub-IH C; IH frequency, 9.23), or 8 min 45 s (sub-IH D; IH frequency, 6.32) or for 30 s in sub-IH E (1.5% O2 and 3 min 45 s normoxia (21% O2) in each cycle for a total of 60 cycles. (2) In the PH group, we performed PH (1.5% O2) for 15 min. (3) In the INO group, we performed 15 s and 3 min 45 s normoxia (21% O2) in each cycle for a total of 60 cycles, which is the same frequency as in the sub-IH B. (4) In the CON group, cells were placed in a standard incubator for 6 h.
After the exposure to the different experimental conditions, MTT (5 mg/ml) was added into the wells of all the experimental plates from the first hour, which was then wrapped with aluminum foil for 4 h at 37°C and 50 ml/l CO2. Subsequently, DMSO was added to dissolve the crystals for the detection of D570. 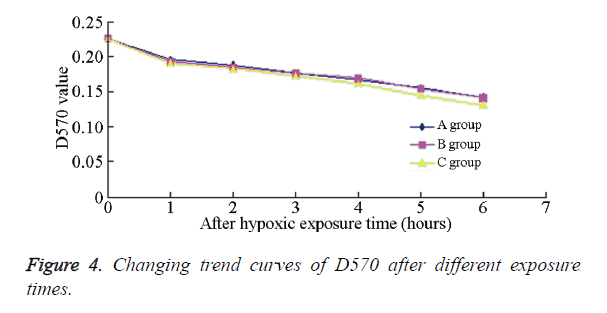 The D570 value was detected sequentially for 6 h to infer the relationship between the exposure time and the absorbance; the trend of D570 was also observed. The value in the CON group was used as the control value to calculate the cell viability in each group based on the following equation: cell viability (%)=D570 of the experimental group/ D570 of the CON group × 100%. The 4ʹ, 6-diamidino-2-phenylindole (DAPI) staining assay was used to detect apoptosis in the neuronal cells. The cell-climbing slides were fixed at 4°C for 5 min, followed by DAPI staining (incubation for 10 min). Slides were subsequently mounted, dried, and analysed using fluorescence microscopy. Cells with three or more DNA fragments were defined as apoptotic, and the apoptosis percentage was calculated. SPSS13.0 software was used for the statistical analysis. The data were expressed as mean ± s, and the independent sample T test was used for intergroup comparisons, with P<0.05 considered as statistically significant. The cells became wall adherent 4 h after inoculation, and few cells exhibited processes 24 h later (Figure 1). On culture d 6, the neuronal bodies were full with clear halo and long and thick processes, forming a dense neural network (Figure 2). Furthermore, fluorescence microscopy revealed the expression of the neuronal marker β-tubulin III in neurons (Figure 3). Figure 1. Neurons cultured for 24 h (X100). Figure 2. Neurons cultured for 6 d (X100). Figure 3. Tubulin B III monoclonal antibody-labeled neurons (X100). The cell viability rates of the different experimental groups are summarized in Table 1. Compared with the PH group, the cell viability in sub-IH groups A-E were significantly decreased (P<0.01), indicating that under the same IH degree and accumulative time, IH exerted a more significant impact on the neuronal activity than PH. Furthermore, there was no significant difference among the sub-IH groups A-D, or between sub-IH groups B and E (P>0.05). An obvious difference could be seen between sub-IH B and INO group (P<0.01), indicating that the same IH frequency, but different degrees, might affect the neuronal survival rate. Figure 4 shows the D570 values of neurons in the different groups at different times; the changing trends in sub-IH groups A and B were chiefly the same, but that in sub-IH group E exhibited a more obvious declining trend. Figure 4. Changing trend curves of D570 after different exposure times. Table 1. Cell viabilities of different groups at different times (%, n=4, ͞x s). Table 2 summarizes the different apoptotic rates under the different experimental conditions. These results reveal how under the same IH degree and cumulative time, IH and INO could significantly increase the percentage of apoptotic neurons compared with continuous oxygen supply (P<0.01). 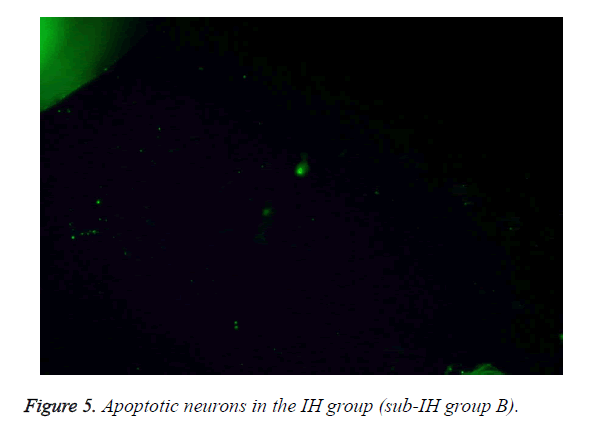 These results were corroborated by the immunofluorescence staining, as can be evidenced by the apoptotic neurons in the sub-IH group B (Figure 5). Figure 5. Apoptotic neurons in the IH group (sub-IH group B). Table 2. Percentages of apoptotic neurons at different times (%, n=4, ͞x s). Cognitive impairments associated with OSAHS have been widely recognized and attracted increasing attention. Studies have indicated that the severity degrees of OSAHS and cognitive impairment are relevant and plausibly associated. Moreover, preliminary findings also found that children with OSAHS were more vulnerable to developing cognitive dysfunctions compared with healthy children. It has been reported that the OSAHS indexes and related cognitive functions could be significantly improved with the progression of surgical treatment . The currently reported OSAHS-related cognitive impairments mainly appear in the aspect of implementation force and behavior, but their impact on language is not significant [18-20]. Despite the significant advances in understanding OSAHS-related cognitive impairments, some important issues still remain unresolved. The sample sizes in the current studies are very small, and the measurements of the cognitive functions still lack standardization and high efficiency. Therefore, the link between the severity of OSAHS and the degree of cognitive dysfunctions is still inconclusive. Currently, most reports addressing cognitive impairments in OSAHS have mainly focused on clinical studies and IH animal experiments [21,22]. Most of these studies focused on the upregulations or downregulations in different cytokines or other enzymes/ factors to elucidate the underlying mechanisms of the pathogenesis of OSAHS. However, many factors could affect these results, and the results obtained so far are often caused by the in vivo protective response over a time period and the interactions among reactive responses. Therefore, these previous results could not be used to determine clearly whether the changes are caused by the exposure of the targeted factors, thus resulting in a great reduction of the possible correlations. Gradually, research at the cellular level in this area has attracted attention. OSAHS-specific hypoxia is chronic and intermittent, and the hypoxia-reoxygenation approach might bear similar pathological changes during the ischemia/reperfusion process, which could thus lead to brain damage and apoptosis in hippocampal and cortical neurons . Cell culture is an important means to study the cell pathophysiology and molecular cell biology, and the in vitro cell culture of primary neurons is currently a widely used technique. Through culturing different cerebral neurons, in vitro models of many nervous system-related diseases have been established. Among these, the most commonly used is the neuronal and neural-glial cell cultures. Due to the features of high differentiation and non-renewability of neurons, the primary culture method is commonly used. The primary neuronal culture of neonatal rats is typically used for investigating neurotransmitters and neuronal plasticity. Moreover, 16-18 d-old neonatal rats are relatively clean, and the cell viability is thus optimal, suggesting this age as valid to study hypoxia or hypoxic encephalopathy. 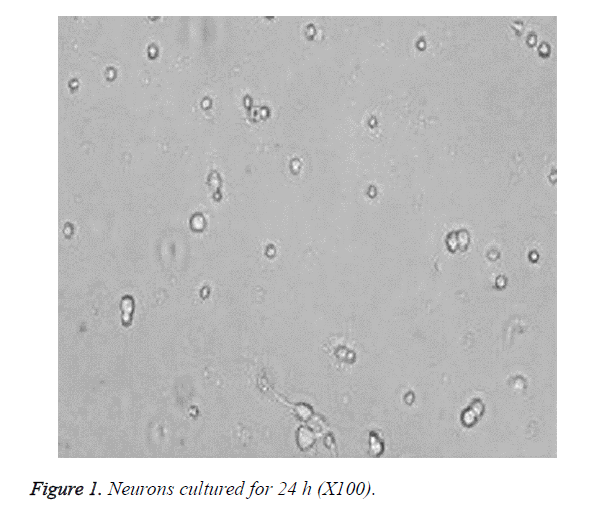 In our present study, we aimed to demonstrate the effects of IH in primary neuronal culture from E16-17 rats. Furthermore, we used a conventional enzymatic digestion method, during which IH was induced to influence neurons. Subsequently, neuronal activity and apoptosis rates were detected after different exposure periods. In a previous electrophysiological study, hippocampal brain slices from gerbils were first preconditioned to hypoxia, which indicated that pre-hypoxia treatment in could produce a significant hypoxia tolerance when subjected again to hypoxic stimulation . Pre-hypoxia treatment was also reported to increase significantly the tolerance of overall cerebral anoxia in rats, and inhibit the injuries in hippocampal neurons . Hypoxic preconditioning of brain tissues could exhibit a protective effect against re-hypoxia injuries, while the endogenous protective roles of hippocampal neurons seemed more “sensitive” than cortical neurons. For our in vitro primary neuronal cultures, we derived cortical neurons from embryonic rats, which were relatively clean and had good cell viability. Furthermore, we assumed that cortical neurons could reflect the effects of IH more accurately than hippocampal neurons. It is currently considered that chronic IH might cause more severe cognitive dysfunctions and nervous system damages compared with sustained hypoxia. However, our present findings indicated that, under the same hypoxia degree and accumulative time, IH exerted a more significant impact on neuronal activity and apoptosis than continuous oxygen supply, which is consistent with previous rat studies [10,25]. This study set four sub-IH groups with different IH frequencies and two sub-IH groups with different IH time periods for the comparison. Between 1-6 h after IH exposure, the neuronal activities and the percentages of apoptotic neurons among the different IH subgroups were comparable. The corresponding oxygen partial pressures in the culture mediums with the same IH degree and different IH times showed obvious differences. In this study, when the IH degree and duration were kept the same among sub-IH groups A-D, the oxygen partial pressures in their culture mediums could basically return to the same level detected at the end of hypoxia. Moreover, although the reoxygenation times were different, the oxygen partial pressures in the culture mediums could basically return to the same levels at the end of reoxygenation. This may explain our present results where no obvious difference was observed in relation to the different IH frequencies (same IH duration and different reoxygenation duration) on the neuronal activities. Several animal experiments have demonstrated an association between the IH degree and time and the extent of the cognitive dysfunctions and nervous system damages [26-29]. In contrast, our results indicated that different IH durations (different hypoxia duration with same reoxygenation duration) exerted no obvious effects on the neuronal activities. One explanation of this discrepancy may be that, after IH exposure in animals, the reactive responses begins, thus manifesting the declining cognitive functions. However, with extending time, a series of in vivo protective mechanisms might take place, and the final results might be actually the interactions of many factors in a certain time. The interactions between the reactive and protective responses may be counteractive, and the final effect could appear as a no change over time. Due to the neuronal injuries caused by IH, as well as the limitations of factors such as the declined neuronal activities with prolonged culture times, longitudinal cell experiments normally could not obtain objective test results due to their inconsistent experimental standards. Indeed, in our present study, we could not perform long-term longitudinal evaluation as in other animal studies. However, in vitro experiments normally have less impacting factors than in vivo experiments, which simulate more realistic reactions to the exposure conditions. It should also be noticed that judging from the declining trend of D570, longer IH exposure might result in more obvious decline of D570 in cells. Based on our results, we believe that the significant declining part reflected the significant changes of oxygen partial pressure in the medium with longer IH time, although it did not reach a detectable or calculable difference. Moreover, the self-designed device could not strictly control the CO2 concentration in the chamber. Therefore, the medium pH changes with exposure time extension might have caused certain bias to our results. This study aimed to evaluate the impact of different IH modes in OSHAS on the neuronal activity and apoptosis in vitro. The established OSAHS-related cognitive impairment cytological model had advantages over in vivo analysis such as (1) fewer influencing factors, (2) direct representation of the exposure factors, and (3) higher accuracy. Studies addressing the OSAHS-related cognitive impairments could thus use this model to detect the correlated factors and signaling pathways of the OSAHS pathology in order to achieve multiple correlation results of a trend. Furthermore, it could also advance experiments to verify the reactions of the entire pathway and to speculate the results of a specific role in order to explore the specific pathophysiological mechanisms of OSAHS-related cognitive impairments. This study was supported by the National Natural Science Foundation of China (No 81170903). Sforza E, Roche F. Sleep apnea syndrome and cognition. Front Neurol 2012; 3: 87. Pietropaoli N, Supino MC, Vitelli O, Rabasco J, Evangelisti M, Forlani M, Parisi P, Villa MP. Cognitive function in preschool children with sleep-disordered breathing. Sleep Breath 2015; 19: 1431-1437. Biggs SN, Walter LM, Jackman AR, Nisbet LC, Weichard AJ, Hollis SL, Davey MJ, Anderson V, Nixon GM, Horne RS. Long-term cognitive and behavioral outcomes following resolution of sleep disordered breathing in preschool children. PLoS One 2015; 10: 0139142. Prilipko O, Huynh N, Schwartz S, Tantrakul V, Kim JH. Task positive and default mode networks during a parametric working memory task in obstructive sleep apnea patients and healthy controls. Sleep 2011; 34: 293-301. Rosenzweig I, Glasser M, Polsek D, Leschziner GD, Williams SC. Sleep apnoea and the brain: a complex relationship. Lancet Respir Med 2015; 3: 404-414. Feng J, Wu Q, Zhang D, Chen BY. Hippocampal impairments are associated with intermittent hypoxia of obstructive sleep apnea. Chin Med J (Engl) 2012; 125: 696-701. Chou YT, Zhan G, Zhu Y, Fenik P, Panossian L, Li Y, Zhang J, Veasey S. C/EBP homologous binding protein (CHOP) underlies neural injury in sleep apnea model. Sleep 2013; 36: 481-492. Cai XH, Li XC, Jin SW, Liang DS, Wen ZW, Cao HC, Mei HF, Wu Y, Lin ZD, Wang LX. Endoplasmic reticulum stress plays critical role in brain damage after chronic intermittent hypoxia in growing rats. Exp Neurol 2014; 257: 148-156. Row BW, Liu R, Xu W, Kheirandish L, Gozal D. Intermittent hypoxia is associated with oxidative stress and spatial learning deficits in the rat. Am J Respir Crit Care Med 2003; 167: 1548-1553. Xu W, Chi L, Row BW, Xu R, Ke Y, Xu B, Luo C, Kheirandish L, Gozal D, Liu R. Increased oxidative stress is associated with chronic intermittent hypoxia-mediated brain cortical neuronal cell apoptosis in a mouse model of sleep apnea. Neuroscience 2004; 126: 313-323. Zhong J, Lee WH. Hydrogen peroxide attenuates insulin-like growth factor-1 neuroprotective effect, prevented by minocycline. Neurochem Int 2007; 51: 398-404. Guo ZY, Li CZ, Li XJ, Wang YL, Mattson MP, Lu CB. The developmental regulation of glutamate receptor-mediated calcium signaling in primary cultured rat hippocampal neurons. Neuroreport 2013; 24: 492-497. Nakatsu Y, Kotake Y, Komasaka K, Hakozaki H, Taguchi R, Kume T, Akaike A, Ohta S. Glutamate excitotoxicity is involved in cell death caused by tributyltin in cultured rat cortical neurons. Toxicol Sci 2006; 89: 235-242. Majd S, Zarifkar A, Rastegar K, Takhshid MA. Culturing adult rat hippocampal neurons with long-interval changing media. Iran biomed J 2008; 12: 101-107. Yang H, Cong R, Na L, Ju G, You SW. Long-term primary culture of highly-pure rat embryonic hippocampal neurons of low-density. Neurochem Res 2010; 35: 1333-1342. Kumar GK, Kim DK, Lee MS, Ramachandran R, Prabhakar NR. Activation of tyrosine hydroxylase by intermittent hypoxia: involvement of serine phosphorylation. J Appl Physiol 2003; 95: 536-544. Wang Y, Wang JJ, Zhao MQ, Liu, Li YZ. Changes of serum brain-derived neurotrophic factor in children with obstructive sleep apnoea-hypopnoea syndrome following adenotonsillectomy. J Int Med Res 2010; 38: 1942-1951. Pan YY, Deng Y, Xu X, Liu YP, Liu HG. Effects of continuous positive airway pressure on cognitive deficits in middle-aged patients with obstructive sleep apnea syndrome: a meta-analysis of randomized controlled trials. Chin Med J (Engl) 2015; 128: 2365-2373. Gagnon K, Baril AA, Gagnon JF, Fortin M, Decary A. Cognitive impairment in obstructive sleep apnea. Pathol Biol (Paris) 2014; 62: 233-240. Martin MS, Sforza E, Roche F, Barthelemy JC, Thomas-Anterion C. Sleep breathing disorders and cognitive function in the elderly: an 8-year follow-up study. The proof-synapse cohort. Sleep 2015; 38: 179-187. Bucks RS, Olaithe M, Eastwood P. Neurocognitive function in obstructive sleep apnoea: a meta-review. Respirology 2013; 18: 61-70. Xie H, Yung WH. Chronic intermittent hypoxia-induced deficits in synaptic plasticity and neurocognitive functions: a role for brain-derived neurotrophic factor. Acta Pharmacol Sin 2012; 33: 5-10. Tokunaga H, Hiramatsu K, Sakaki T. Effect of preceding in vivo sublethal ischemia on the evoked potentials during secondary in vitro hypoxia evaluated with gerbil hippocampal slices. Brain Res 1998; 784: 316-320. Gong SJ, Chen LY, Zhang M, Gong JX, Ma YX, Zhang JM, Wang YJ, Hu YY, Sun XC, Li WB, Zhang Y. Intermittent hypobaric hypoxia preconditioning induced brain ischemic tolerance by up-regulating glial glutamate transporter-1 in rats. Neurochem Res 2012; 37: 527-537. Nair D, Dayyat EA, Zhang SX, Wang Y, Gozal D. Intermittent hypoxia-induced cognitive deficits are mediated by NADPH oxidase activity in a murine model of sleep apnea. PLoS One 2011; 6: e19847. Li LQ, Cao JL, Li L, Han XQ, Wang HY, Liang XM, Wang L, Zhang M, Wang YN, Duan LJ. The effect of chronic intermittent hypoxia on cognitive function and prefrontal cortex neurons in rats. Sichuan Da Xue Xue Bao Yi Xue Ban 2015; 46: 702-705. Angelo MF, Aguirre A, Avilés Reyes RX, Villarreal A, Lukin J, Melendez M, Vanasco V, Barker P, Alvarez S, Epstein A, Jerusalinsky D, Ramos AJ. The proinflammatory RAGE/NF-?B pathway is involved in neuronal damage and reactive gliosis in a model of sleep apnea by intermittent hypoxia. PLoS One 2014; 9: e107901. Al-Qahtani JM, Abdel-Wahab BA, Abd El-Aziz SM. Long-term moderate dose exogenous erythropoietin treatment protects from intermittent hypoxia-induced spatial learning deficits and hippocampal oxidative stress in young rats. Neurochem Res 2014; 39: 161-171. Dayyat EA, Zhang SX, Wang Y, Cheng ZJ, Gozal D. Exogenous erythropoietin administration attenuates intermittent hypoxia-induced cognitive deficits in a murine model of sleep apnea. BMC Neurosci 2012; 13: 77.